The Aflaj Irrigation System comprises 5 of the some 3,000 still functioning complete settlement irrigation systems in Oman. The sites are an exceptionally well preserved form of land-use. They are still functioning as integral and essential aspects of the production systems of villages and towns, and are still managed by long-standing traditional systems within the communities they serve. The Aflaj are as typical of Oman as its fortresses. Nearly every village or town with roots older than Sultan Qaboos’s reign has such a falaj irrigation system. A combination of 5 out of the more than 3,000 still functioning systems have been declared a World Heritage Site. Of these 5, I visited the ones in Birkat Al-Mouz (Falaj Al-Khatmeen) and Nizwa (Falaj Daris). To both there is no formal access, they just lie in public areas. The town of Birkat Al-Mouz is conveniently located en route between Muscat and Nizwa. When I parked my rental car at the local fort, I was immediately approached by a man in a 4x4 who asked whether I wanted a tour to the nearby mountain Jebel Akhdar. The "green mountain" is rather dry at this time of year, so I let that opportunity pass me by. For most tourists however the mountain is a bigger attraction than a falaj. The downhill stream of the Falaj Al-Khatmeen is easy to follow in Birkat Al-Mouz. It first appears above ground at the back of the Bait al Radidah fortress. Then it flows past the mosque, where there also are ablution spaces using the falaj (they look like dressing rooms or public toilets). Next to it is the WHS marker: a square column with the inscription text in 4 languages - Arabic, English, German and (I am not sure about this one) French. Later in the day I encountered the same style of marker at Falaj Daris. The irrigation channel itself is not a spectacular sight, but coming closer to daily life in a village like Birkat is worth the visit in itself. Birkat’s town center has some large trees that provide much appreciated shade. A group of older men were sitting underneath them on the sand, playing dominoes. Others used the stone edge of the falaj as a bench. The channel here splits into several branches to distribute the water around town. I continued my walk along a field with date palms. Two men were busy trimming one of the palm trees at the top, so that the dates will have the space to grow. Following the advice from my Bradt Travel Guide, I went further into the village. Still the many branches of the irrigation canal were all around to see. After fifteen minutes I arrived at the gate of a cluster of wonderfully ramshackle mud houses. Most inhabitants have left this part of the village to settle in more modern houses elsewhere in Birkat Al-Mouz. But still some seem to be inhabited, at least I noticed laundry hanging outside to dry. Later in the day I made my way to Falaj Daris, just north of Nizwa. It is signposted from the road to Bahla, just keep on going til you see the brown sign. Here they have designed a park around the old falaj. There were some children playing, and young guys noisily crossed the terrain with mopeds. People swim or even bathe in this falaj. It has plenty of water in it, and it is much broader than the one in Birkat Al-Mouz. Unfortunately there is only a short stretch of the falaj above the ground, so it is of limited interest. In Birkat Al-Mouz I spent almost one and a half hour, in Nizwa less than 5 minutes…. I was the Resident Architect for the new Souq in Nizwa from 1990-1992, working for CowiConsult. Marfa Daris Park began as a provisional sum in a local roads improvements contract, and I was given the opportunity to come up with a design and oversee the construction of the park. We had some prior experience for this, having designed a "pocket park" at the base of the new road bridge upstream from the souq. Up to that time the local kids had never seen play equipment, and it was very popular. The design philosophy for Marfa Daris Park recognised its importance as a historic stopping point on the former Frankincese Trail, a place of religious significance long before there was a local mosque, where the broad steps down to the falaj were used for washing prior to prayers on a level area of stony ground adjacent. The same point, close to the emergence of the falaj out of the main wadi bed, was also a place of great cultural significance: HM Sultan Qaboos would often make stops there to show visiting dignitaries the falaj and explain its importance. The masterplan for the park was an outcome of its geography, the religious and ceremonial importance, and the need for a local park that would be popular with the local populace. Falaj Daris itself forms the boundary to the main wadi, with a meandering path alongside that loops up to an elevated bandstand on a prominence at the western end of the park. The stone steps down to the falaj are the focus of the religious/ceremonial axis. A magnificent Ficus Religiosa fig was located in a large circular planter with stone benches opposite the steps, and this acts as a fulcrum for a ceremonial axis that is straddled by a Reception Building in the form of a traditional tower with a watchman's apartment accommodated at the upper levels. Gardens and lawns flank the ceremonial axis, intersected by paths and gazebos along its length and leading to an amenities building adjacent to play areas for children. The local kids love excitement, and scrambling around the hills in the area, so the play areas were zoned up the side of the wadi from safe areas for toddlers at the bottom, past a series of play areas for older kids and culminating in long slope slides on a rocky hillside shaded by canopies to protect them from the heat of the summer sun. A BMX track was formed in the original scrub and acacia trees along the hillside, much to the pleasure of the neighborhood children. The progression from formality to the natural ruggedness of the area continued beyond the play area and culminates at the bandstand, high on the hillside and providing a visual focus at the far end of the ceremonial axis. Wadi Daris floods regularly following thunderstorms on the jebel, so it was necessary to ensure that floodwaters would not damage the buildings, and the stone bases and level changes ensured that they were protected and kept above normal flood levels. Runoff from the roads and populated areas uphill of the park is all intercepted by stone-lined culverts which carry it beyond the falaj into the main wadi to avoid polluting the falaj water and the fish that can be seen swimming in it. The buildings themselves were constructed in modern materials, but rendered with traditional sarooj plaster - a rich-coloured render that is made by firing large quantities of clay plugs on pyres of date-palm trunks, with the ash and fired clay crushed and mixed into a powder and mixed with water. Recent photos attest to the success of the landscaping design carried out by Paul Cracknell, the success of the park in its unique combination of cultural and recreational facilities, and its selection as the focus of the UNESCO award. On a trip to Oman in December 2012, I managed to visit 4 of the 5 aflaj irrigation systems on the list (I arabic, aflaj is the plural form of falaj). 3 of them are close to Nizwa, a good base to visit the area. The irrigation system is composed of three elements, all three part of the listed proprety : first the upstream part (collection of groudwater or spring waters) that are drawn into collecting channels, mostly underground. Then a main channel (the shari’a) is usually open surface. Finally, downstream, an agricultural area irrigated by smaller irrigation channels. As the sources and collectioning channels are mostly underground, there is not much to see. The shari’a is usually easy to spot. And the agricultural area and the irrigating channels are in large green areas dotted with villages houses and small roads forming a labyrinth in which it is really easy to get lost. I found it very useful to print the maps in the nominating papers to find my way to the aflaj (even if the map of Falaj Al-Khatmeen is wrong, and the nominated area do not match the underlying map). Falaj Daris (Nizwa) is easy to find. It is is clearly signposted a few kilometers north of Nizwa town. (It is not signposted if you drive in the opposite direction). There is a park next to the shari’a, popular with local resident for afetrnoon walk. This aflaj is one of the largest and oldest in Oman. It might look a bit disappointing and I would recommand to visit the two next aflaj. Falaj Al-Khatmeen (Birkat al-Mouz) lies in a the very nice looking village of Birkat-al-Mouz, some 20 km east of Niza. I stayed at the Golden Tulip Nizwa Hotel (a good choice) which is closer from Birkat than from Nizwa. The shari’a is very easy to spot as it runs under the town’s fort. Dowstream, it passes a mosque (and a place for ablution), and then splits into three equal irrigating channels. From there, you can follow any stream into the agricultural area of the village, with palm trees and mus houses all around. On top of the hills, many watch tower can been seen ; they were used to protect the aflaj. On a small hill above the village is the ruins of the old Birkat-al-Mouz, a very atmospheric abandonned village. Falaj Al-Malki (in Izki) lies 10 km east of Birkat al-Mouz. The shari’a run under the main road, but is difficult to spot (even with a map). It is easier to leave the main road and get into any part of the old town and go by chance. The old town is a real labyrinth of small roads bordered by mud walls and houses, date trees and other crop fields, but you are sure to find the multiples branches of the irrigations channels. In the middle of this labyrinth lies the ruins of a very large fort. Be ready to get lost in this village. But it is worth the time lost. Falaj Al Jeela lies high in the mountains, and cannot be easily reached (it probably needs a guide and a 4x4). Driving from Muscat, the capital city of Oman, to the city of Nizwa was my first time to see Middle East desert environment, I was shocked to witness how dry of the landscape could be, all red lands and dark mountains looked like they had been burned by fire with no single tree or a sign of life except fast driving cars on the road. The desert environment was far worse than deserts in China or Uzbekistan. Then I started to saw communities in the valley along the dry rivers called “Wadi” at first I understood that the villages survived by seasonal water from the river, but when I visited these villages, it was falaj system that supplied water to the communities. During my Oman trip I saw Omani Aflaj in many towns and villages, but for UNESCO listed ones, I only saw Falaj Daris in Nizwa which was the biggest falaj in the country and its water sources were just outside the city center on the way along old Nizwa – Bahla road. However I could not see falaj sources as they were underground, also aboveground were incredibly dry river bed and full of rocks and gravels that seem to be impossible to have water tunnels underneath such unfriendly terrain. Falaj first appeared aboveground in the newly created park just outside Nizwa next to the dry river. Its appearance was like a small canal with stone wall that covered with mortar. The canal continued into the residential zone and very green plantations in the city passing mosque and a small fort. Unfortunately that Falaj Daris did not match my expectation despite its size and very sophisticated water channels as I had seen the much simpler and smaller one at Misfat Al Abreen where I could see how community managed the water for households and agriculture as well as the separation zone of male and female areas in washing pool area, so I expected some similarities at Nizwa, but Nizwa’s falaj seem to be mainly for agriculture and that made Falaj Daris to be looked like just a normal irrigation system, nevertheless I really enjoyed the plantations along the falaj with interesting plant like date, banana, alfalfa and grass to protect soil and conserve water against desert heat. For me Omani Aflaj is another good example of World Heritage Site that its outstanding value cannot be seen easily, as there were no visual differences of falaj and other normal irrigation system in any part of the world, if I never had seen a fascinating German documentary about an Omani village that was facing a drying falaj and had to send people to find new water springs along the ancient underground falaj tunnel and its open access shafts many times, I would probably ranked this World Heritage Site among the lowest. From the documentary I found out that Aflaj was fascinating and I really admired ancient people who dug a complex of tunnels to link springs into the community. Also falaj did show me how important of water in the desert environment as a key of urban settlement in Oman especially for the city like Nizwa as well as the human abilities to survive and create perfect environment for living and farming, so Omani Aflaj were truly an interesting World Heritage Site of Oman. Of all the aflaj in Oman and the UAE, only one that I saw in 2010 is included in this WHS. That is the falaj al Muyassar that flows through Rustaq, and beneath the fort (on WH tentative list). The portion I have seen flows through a date plantation, then beneath the fort, and in an open channel out into Rustaq village. It then continues in an open channel through the village. In 2011, while staying in Nizwa I visited several others, at Falaj Daris, at a spot where steps are provided for washing prior to attending mosque. The Falaj Al-Khatmeen was easily located at Birkat Al Mawz in a date plantation adjacent to the fort. Less easy to find was Falaj Al-Malki, located in what is now a new housing estate. It was not in a very clean state either. I personally took all the photos of aflaj shown at the link to the newsbriefsoman gallery from this page, (please note the spelling error - Photos of Aflay (sic) in Oman), and I am delighted that they are being used as a resource for this World Heritage Site. I worked at the Ministry of Water Resources in Muscat from the end of 1991 to mid-2000, and would be happy to answer any queries. There are other entries on the newsbriefsoman blog about Oman. You can read a description of the three types of falaj found in Oman and see a diagram of a cross-section of a dawoodi falaj at http://www.newsbriefsoman.info/index.php?itemid=50. Nizwa has a population of around 60000 and is a tourist center - this, more than the example itself, may have had something to do with the selection (which also increases to 3 the number of WHS within a short drive of this town!). 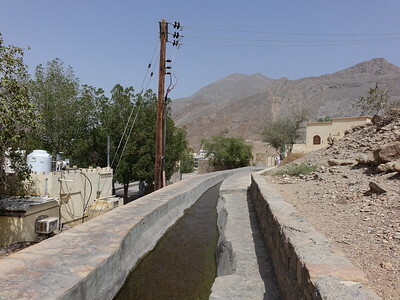 The system is 8 kms long and, as is the way with aflaj, much of the channel from the source is underground (There are 3 types of Falaj and Nizwa’s is a Daoudi which taps into underground water as opposed to using a spring, river or dam. Where the water appears from the tunnels for distribution is called the shari’a and, in Nizwa, a small park has been created there, which is no doubt a pleasant place to escape the summer heat and enjoy the shade and running water. It is clearly signed on the outskirts of town to the right on the road to Bahla. Our photo is of this spot and also shows the cement mortar used in restoration to cap the channels. This caused ICOMOS much consternation (they wanted traditional mortar to be used) and was one of the factors which led them to recommend deferral rather than inscription in 2006 (Quite what caused WHC to ignore this advice in a year when they threw out so many other nominations is not yet clear!). They also disliked the lack of historical documentation of age and the lack of management plans etc. In the background it also seemed that they were concerned as to whether the irrigation systems were, per se, special enough worldwide either in terms of technology or history to justify inscription and very much wanted the whole “Cultural Landscape” aspect to be covered. Certainly we have seen similar underground water movement technology used in China (There is a good site at Turpan) and in Iran/Turkmenistan (where they are called Qanats) so ICOMOS were right to be concerned about the “Universal Value” of aflaj. As for the 5 sites inscribed, well I can’t comment on the other 4 (Of these the Khatmee is also near Nizwa and the Al Malki is on the main road from Muscat to Nizwa near Izki), but we saw far nicer ones than the Daris at Nizwa. These tended to be in villages – we particularly remember Al Hamra, Tanuf and Misfah near to Nizwa and the A’samdi Falaj near Sumail. Omanis are friendly and courteous - express an interest in the village Falaj and you may be invited in for Coffee and dates (we were!). In the villages you will be more able to see and understand the overall layout and the gradual change in use of the water as it flows – from collection for drinking through male/female ablution areas, clothes washing and finally into the date fields. You will also see the Sun dials used traditionally to time the distribution of water. To visit Oman and not try to see and explore the Aflaj system would be to miss an important aspect of Omani culture – for that reason this inscription is to be welcomed whatever the merits or otherwise of the sites chosen. Palm Groves: Crit v The collection of Aflaj irrigation systems represents some 3,000 still functioning systems in Oman. Ancient engineering technologies demonstrate long standing, sustainable use of water resources for the cultivation of palms and other produce in extremely arid desert lands. Cultural landscape not recognized: ICOMOS: "The wider nomination should be considered as a collection of cultural landscapes representing distinctive, long-standing, sustainable and living ways of managing water resources"